15 days | EARLY BIRD PRICING – AU$7695* pp | Bookings closed. Contact us about 2019 tours. Experience a winter wonderland in Japan! From the world famous Sapporo Snow Festival, to unique wildlife including cheeky snow monkeys, elegant tancho cranes, the world’s largest eagles, and snow-covered landscapes, winter is an amazing time to experience Japan. Join us on our incredible 15-day Hokkaido Winter Tour, where you will experience these amazing winter highlights of Japan! 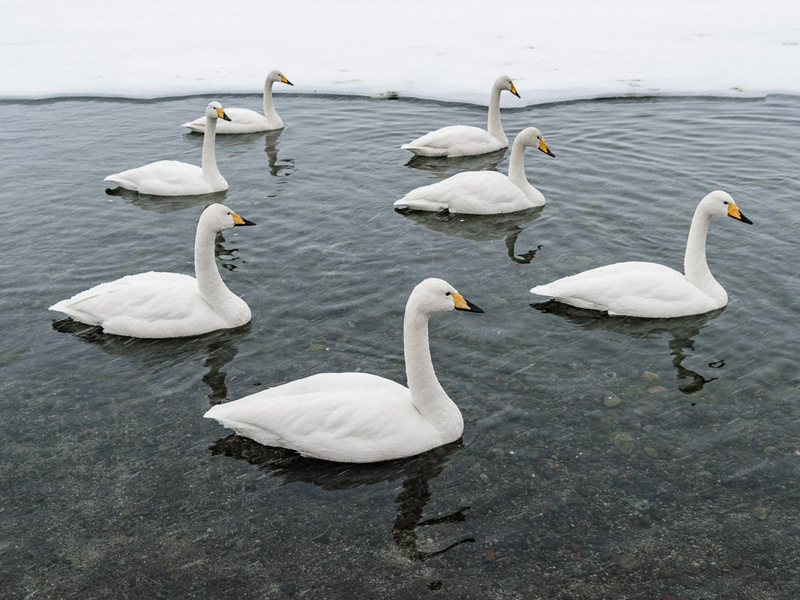 Led by Julius Pang, a Japan expert and multi-award-winning travel photographer, you’ll learn how to take better travel photos and visit the best spots in Hokkaido to take amazing photos of the winter landscapes and wildlife. 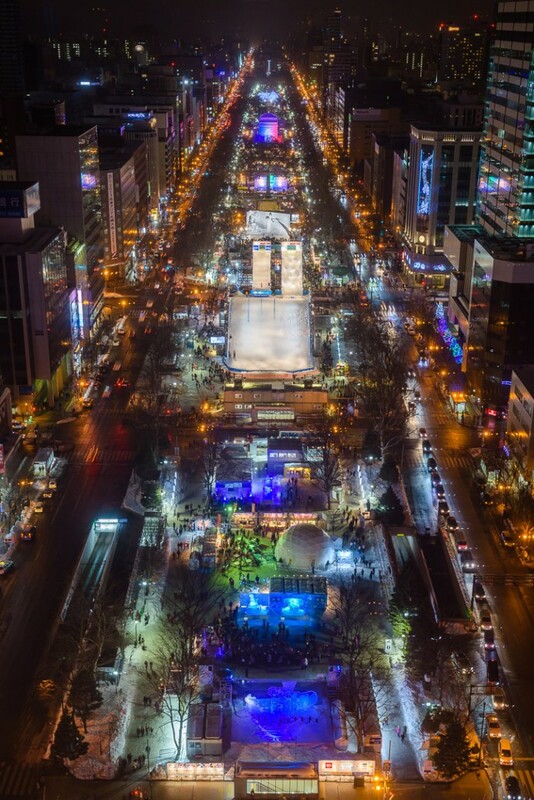 Starting in Sapporo with the Sapporo Snow Festival, visitors from all over the world come here to see the amazing grand snow and ice sculptures in the centre of Sapporo. Highlights of this tour include the world-famous snow monkeys of Nagano, the most northern and coldest climate living monkey species in the world. The beautiful town of Biei, famed for its beautiful rolling landscapes and trees. The stunning night view of Hakodate. 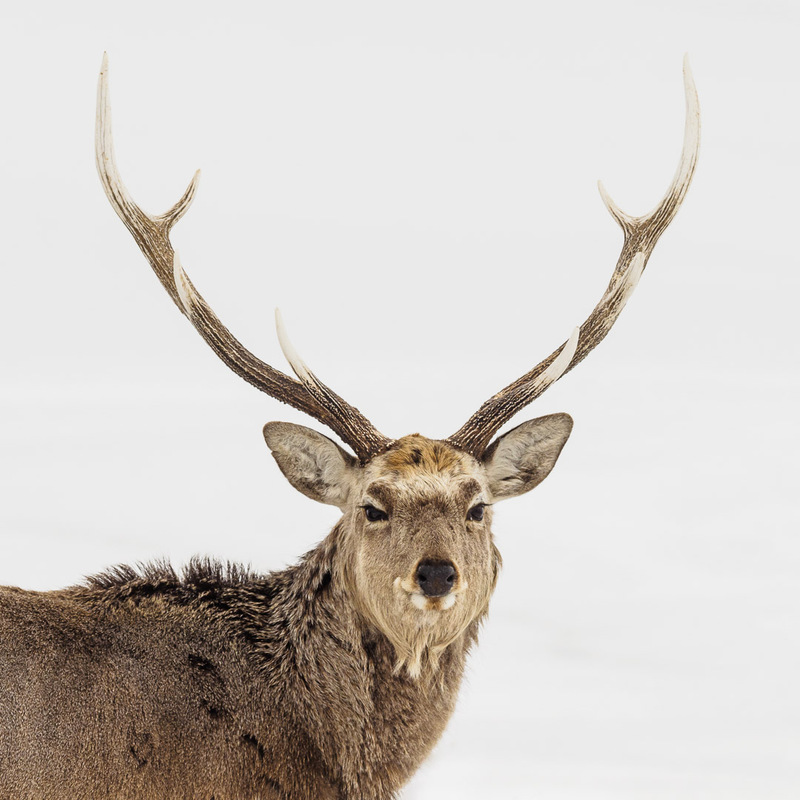 Over in eastern Hokkaido, you’ll experience some of the most amazing winter wildlife in the world up close. In Kushiro, Japan’s national bird, the tancho cranes come every day to feed and are the picture of elegance as fly and dance. The town of Rausu is known as the eagle capital of the world with the winter migration of hundreds of Steller’s Sea Eagles and White Tail Eagles. There is also the Blakiston’s Fish Owl here, the world’s largest owl and an endangered species. Our tour ends in Tokyo, Japan’s amazing capital and the world’s largest metropolis. This is the tour that shows you the postcard shots, the nature, and the secret hot spots of winter Japan. 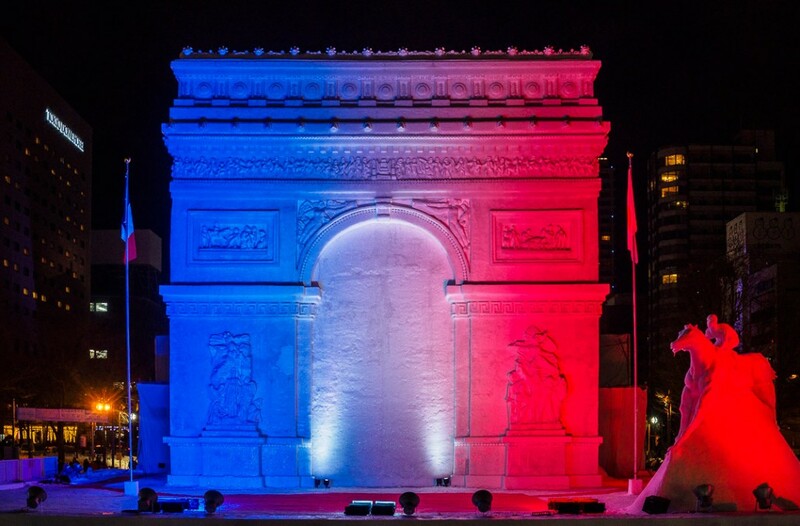 Book now – all you need is your camera and passport! 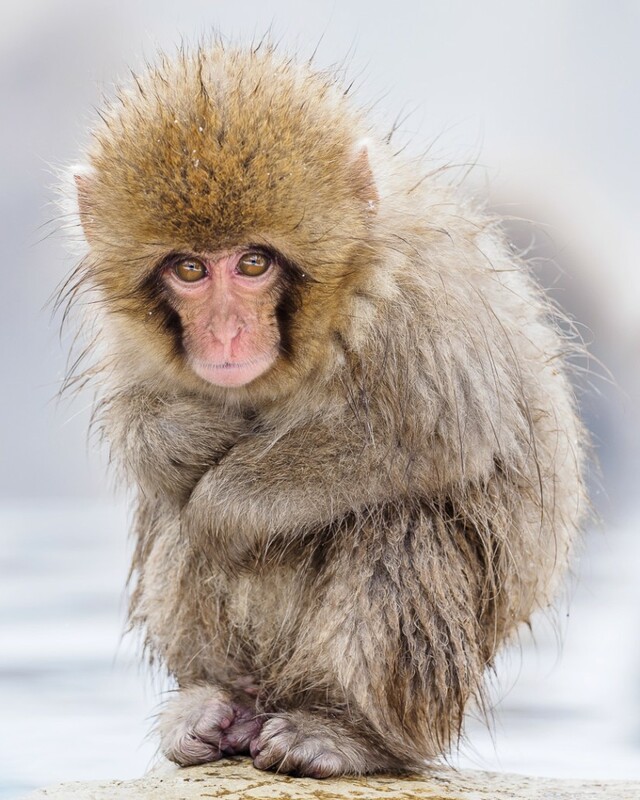 Snow Monkeys – the Japanese macaques of Nagano prefecture are the world’s most northern-living monkeys and even have their own hot spring to enjoy! Hakodate – port city in southern Hokkaido and featuring one of the best night views in Japan. Biei – arguably the most photogenic town in Japan. Famed for its rolling hills and trees all year round. 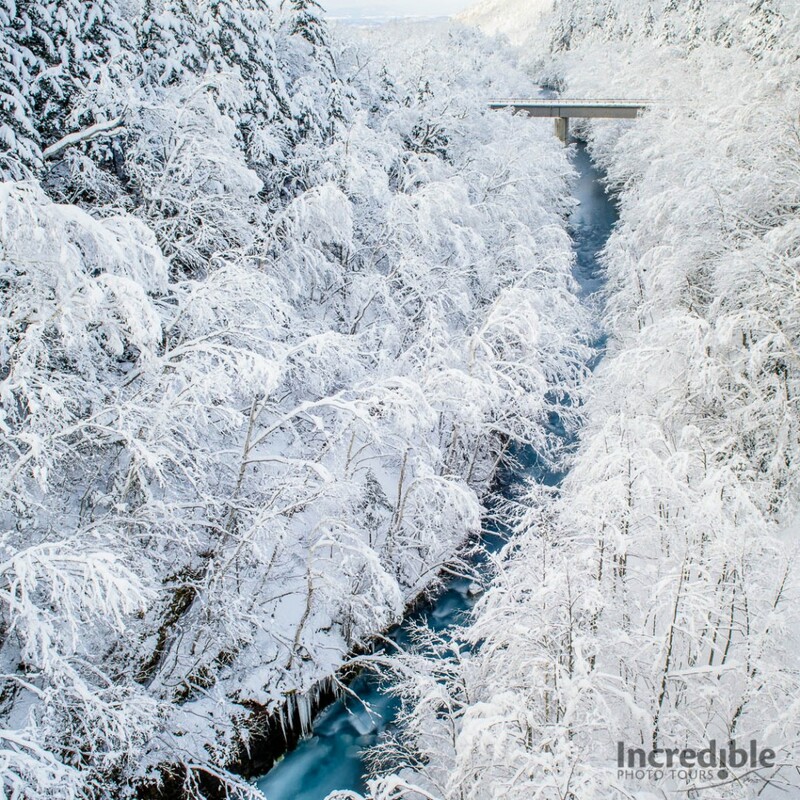 Shirohige Falls – a stunning waterfall that drops into the Biei River, lined with snow-covered trees along its banks. Tancho cranes – the national bird of Japan, these elegant cranes are endangered and live in eastern Hokkaido where they have protected breeding and feeding grounds. 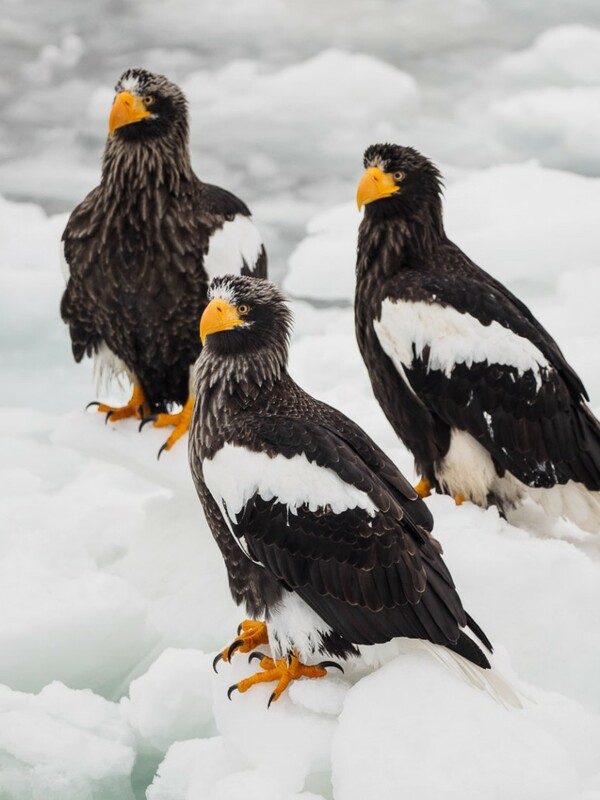 Steller’s Sea Eagles – the world’s largest eagle, these birds flock to Rausu every winter as part of their migration. White Tailed Eagles – another enormous eagle and they come to Rausu every winter together with the Steller’s Sea Eagles. Blakiston’s Fish Owl – this is the world’s largest owl and critically endangered, with a regular viewing spot available only in Rausu. Additional local transport and entry fees outside of itinerary. If you are flying out of Sapporo, you will need to organise a flight from Tokyo to Sapporo at the end of the tour. Please contact us for advice regarding this. Limited places available for this Japan winter photography tour! * All prices shown are based per person in Australian dollars and include all taxes, gratuities, land transport, and some meals as indicated. Accommodation provided is based on twin share. Single supplement available at additional cost of $1295. Airfares are not included and must be organised separately. Prices and itineraries at time of publishing but are subject to change. Payments online using Paypal attract a 3.6% service charge. No service charge applicable for direct deposit payments. International telegraphic transfer payments will incur send and receive charges. Please call or email us for more details. View our full terms & conditions here. Places visited: Tokyo, Nagano, Hakodate, Sapporo, Asahikawa, Biei, Kushiro, Lake Kussharo, Rausu. 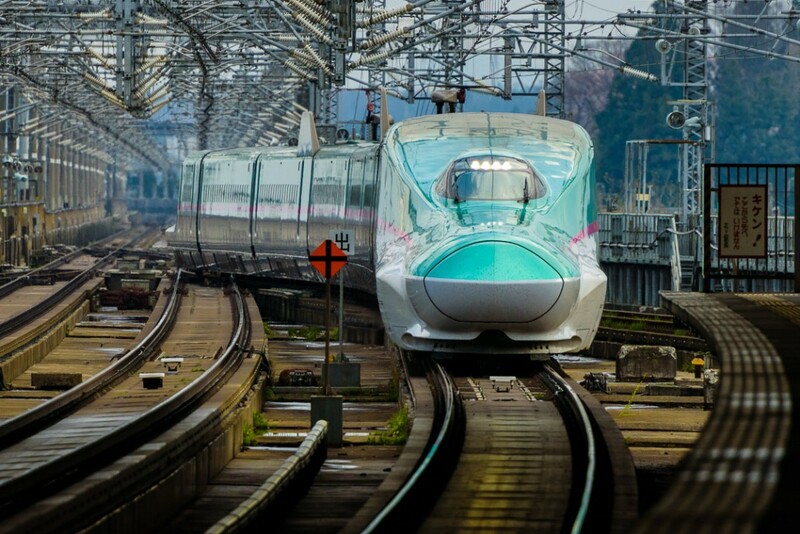 Transport: Bullet train, regular train, plane, private minivan, public bus, taxi. Extra days: Pre and post-tour accommodation available. Book here. Price: AU$7695 pp (twin share double room) – Early bird pricing until 10 September 2017! Arrive at Sapporo Shin-Chitose Airport and make your way to our accommodation. A welcome dinner will be held and we’ll discuss the photography and activities we will undertake in Sapporo over the next two days. 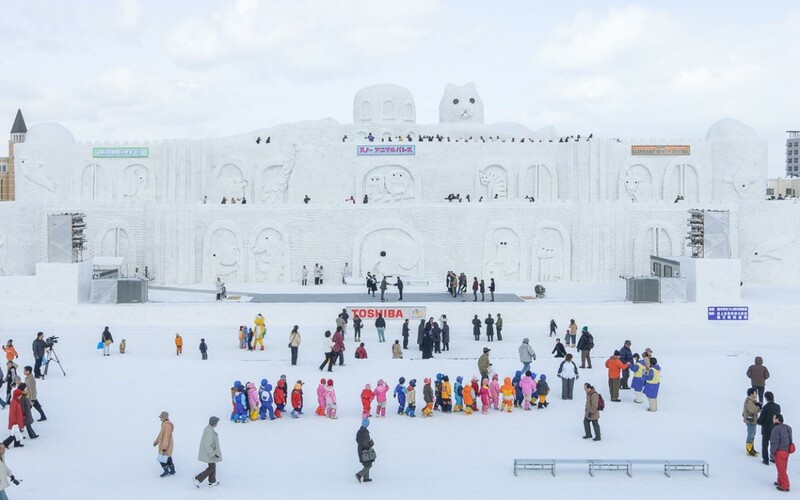 A whole day exploring Sapporo during the largest winter festival in Japan – the world-famous Sapporo Snow Festival! Featuring enormous snow sculptures all along Odori Park, ice sculptures in the Susukino entertainment district, and lots of delicious local festival food on offer. Visit the Sapporo Beer Museum, and learn about the history of beer in Japan, followed by a cheap beer tasting! Or try a Hokkaido specialty, Genghis Khan Barbeque – a delicious lamb barbeque served with lots of vegetables that goes perfectly with beer! In the afternoon, we visit the Okuriyama Ski Jump, used in the 1972 Sapporo Winter Olympics, and a beautiful vantage point overlooking Sapporo City. 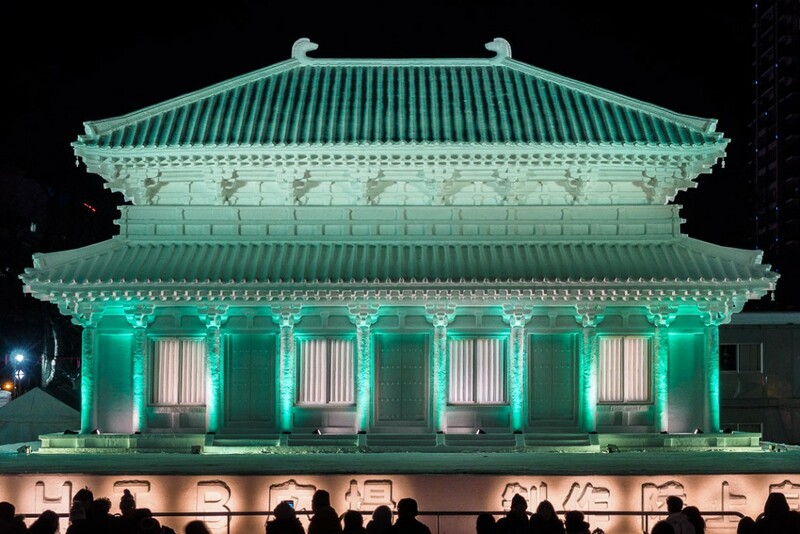 In the evening, we make our way to the small port city of Otaru in the evening for their Snow Light Path Festival. During this festival, Otaru becomes decorated with lights and small snow sculptures, leading the way to the Otaru Canal, a historic and beautifully preserved part of the city. A final morning in Sapporo to explore the Sapporo Snow Festival before heading into Asahikawa for the final day of the Asahikawa Winter Festival, featuring one of the world’s largest snow sculptures as the centrepiece. 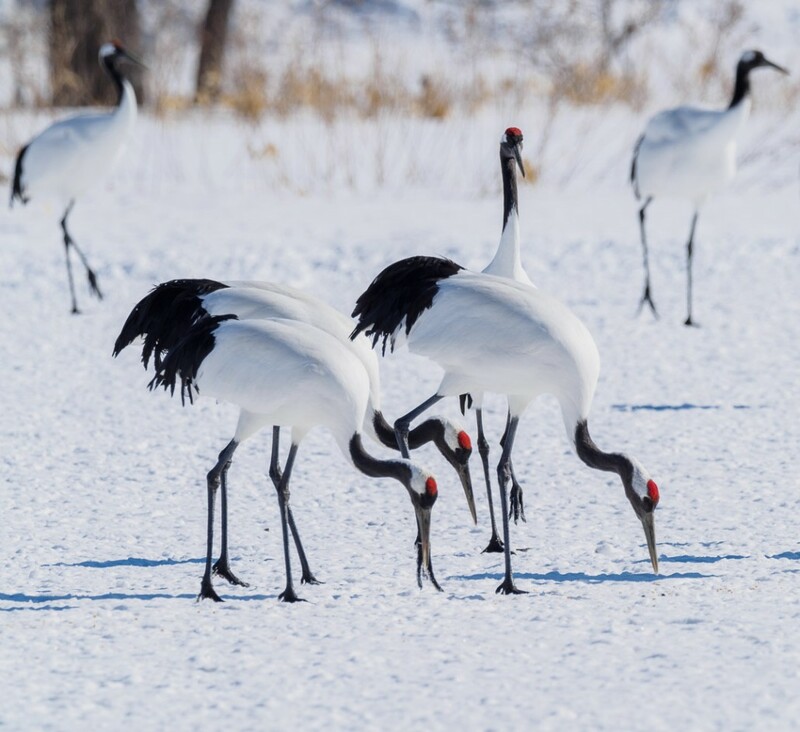 We make our way to eastern Hokkaido to Kushiro, which will be our base for the next couple of days as we photograph the iconic tancho cranes (red crowned cranes), the national bird of Japan. This species is amongst the rarest cranes in the world and Kushiro is home to a resident population and breeding program for these beautiful birds. In the afternoon, we’ll visit the Akan International Crane Center feeding ground for our first experience seeing the tancho cranes. We spend all day today photographing the wonderful tancho cranes. A pre-dawn start as we head out to the famed Otowa Bridge from where we can see a resting spot for the cranes. 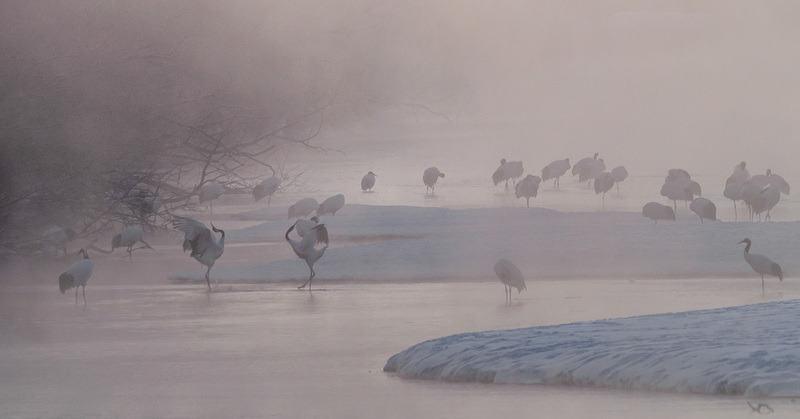 During very cold weather, mist forms over the river creating a beautifully atmospheric scene as cranes fly in and dance about in the distance. 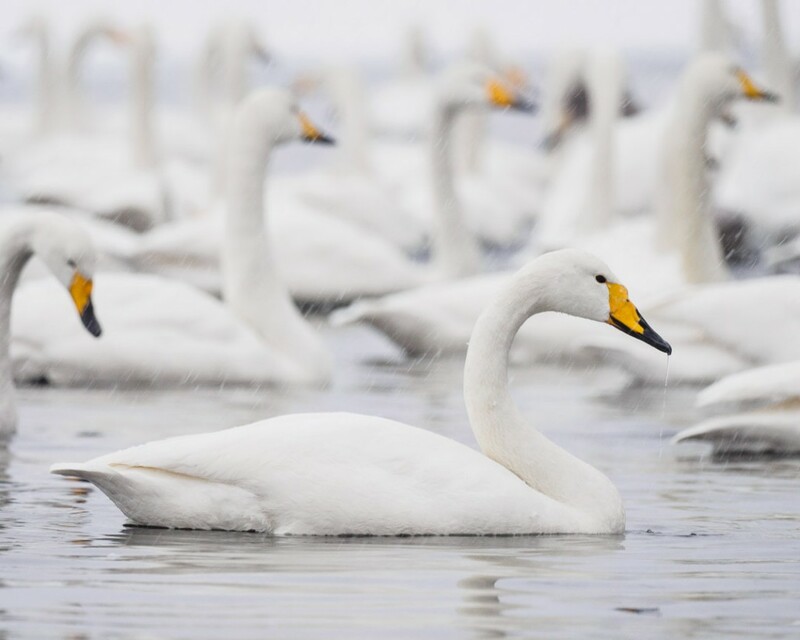 After some rest back at our hotel and lunch, we head north to Lake Kusharro and its resident population of whooper swans. The lake freezes over during winter except near the edge of the lake due to the persence of hot springs. We say goodbye to the tancho cranes this morning as as make our way further east. 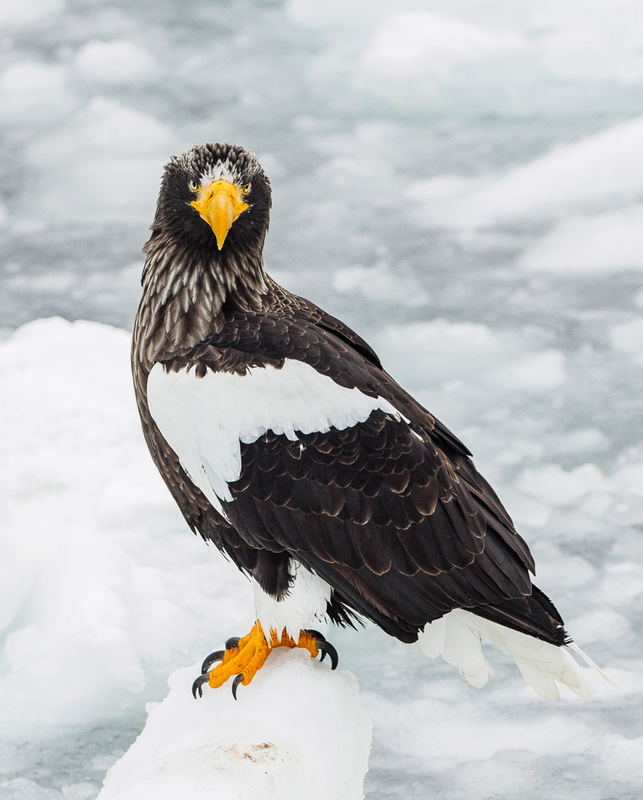 During winter, 2000-odd Steller’s sea eagles – almost a third of the species’ population – migrate to Hokkaido, with most ending up around Rausu. Steller’s sea eagles are the largest species of eagle in the world, with a wingspan of up to 2m and weighing up to 9kg. Joining the Steller’s sea eagles are just as many white-tailed eagles, also amongst the largest eagle species. In the evening, we visit a special viewing spot for a chance to see the endangered Blakiston’s fish owl, the largest owl species in the world. A very special morning on this tour as we board a special morning boat cruise amongst the drift ice off Rausu port to photograph the sea eagles. In the afternoon we’ll make our way to the Notsuke Peninsula to photograph some of the strangely withered trees of this area, and the chance to see Ezo deer. 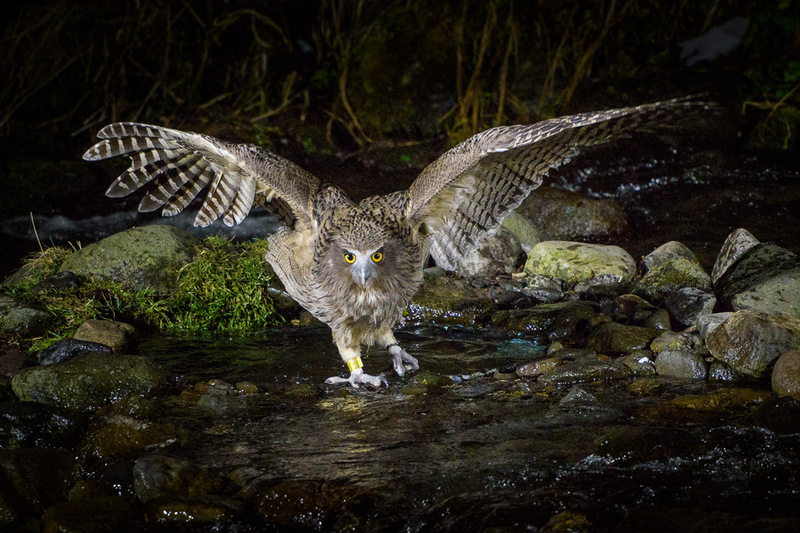 We also have the option to return to Rausu for another night session of photographing the Blakiston’s fish owl. We head back towards central Hokkaido today and return to Biei. 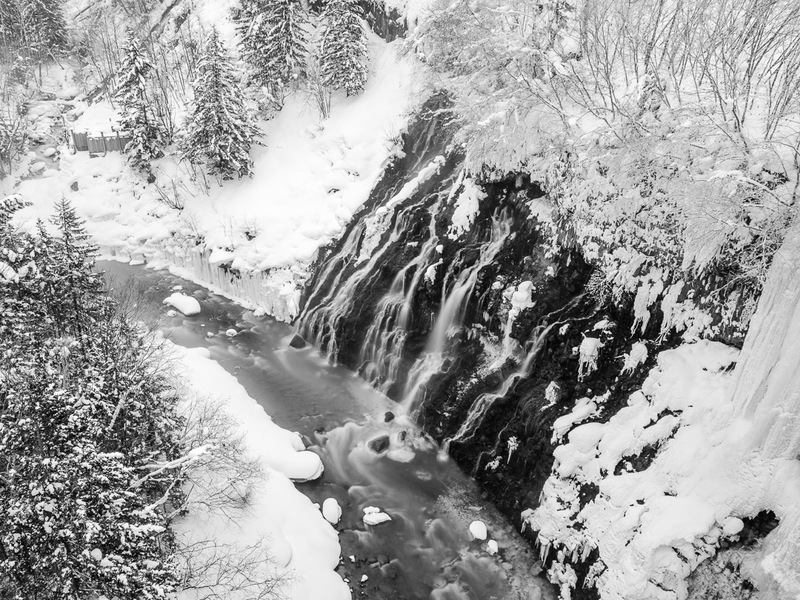 We explore more of the amazing winter landscapes around Biei, including Shirohige Falls, a beautiful waterfall that falls into the Biei River with its snow-covered trees along its banks. A full day of exploring picturesque Biei today. 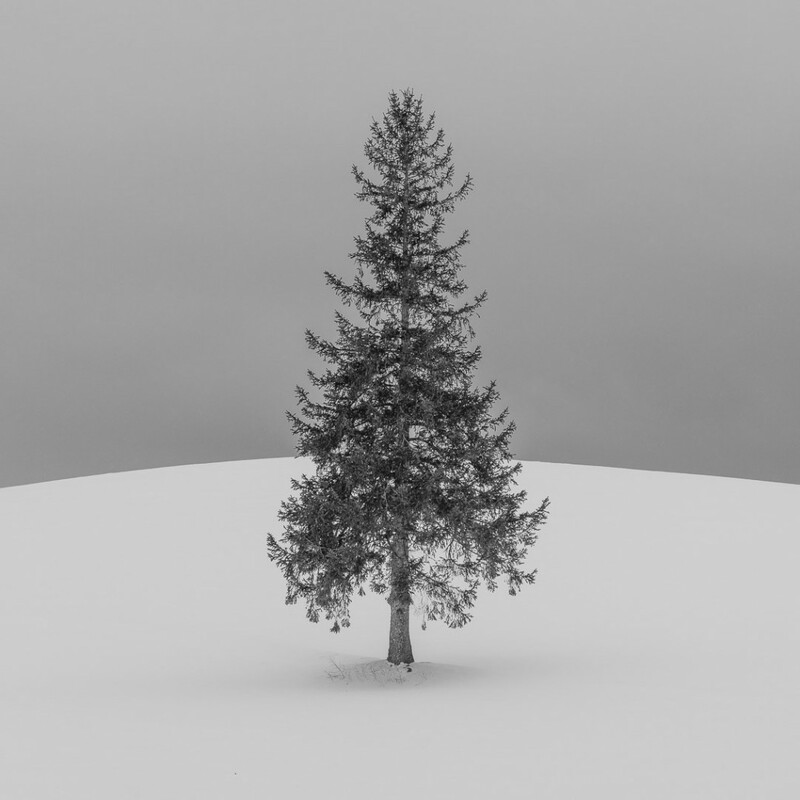 The beautiful trees and rolling hills of the area have features in numerous Japanese commercials over the years, and during winter they draw photographers from all over Japan and overseas looking to capture minimalist landscapes. We make our way to the port city of Hakodate located in southern Hokkaido. Hakodate was one of Japan’s first port cities that was open to international trade and has had significant foreign influence, with several well-preserved heritage buildings in the Motomachi district. In the evening we make our way up to the Hakodate Ropeway to see one of the most stunning night views in all of Japan. We leave Hokkaido this morning with a ride on the Hokkaido Shinkansen, Japan’s newest and fastest bullet train. We pass through the Seikan Tunnel which connects Honshu island with Hokkaido island. Watch the beautiful snowy landscapes as we speed by at up to 320kph towards Tokyo. 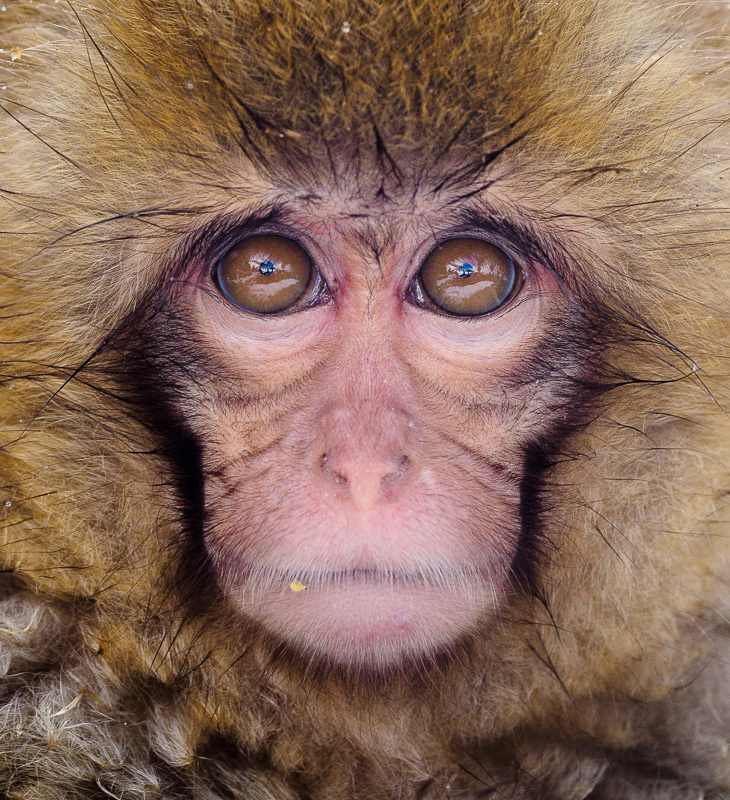 After a short break in Tokyo, we head to Nagano prefecture, home to the world-famous snow monkeys. An early morning start to visit the Snow Monkey Park in the Yudanaka Onsen area. Watch as the famous snow monkeys frolic and relax in their own hot spring! In the afternoon we head to Matsumoto to visit the stunning Matsumoto Castle, one of only 12 original castles in Japan, and ranked among the best. 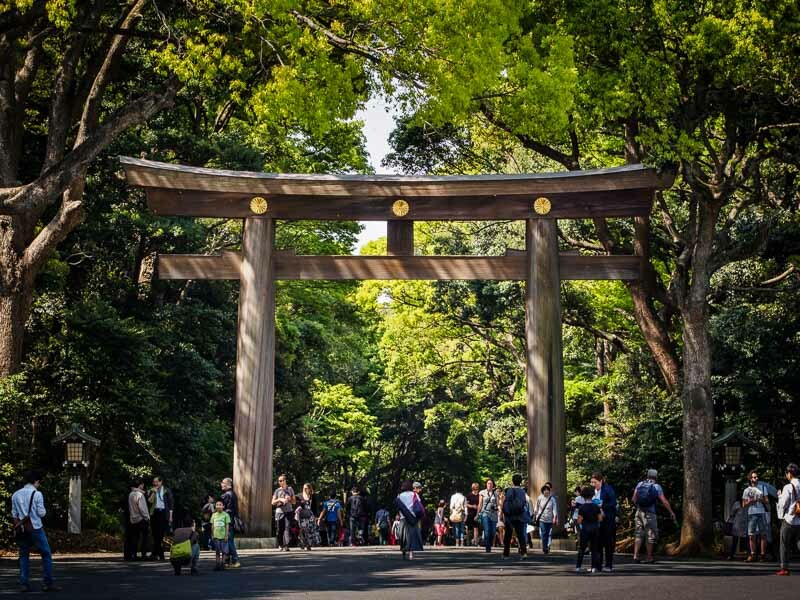 Our first day in Tokyo begins with a visit to vibrant Harajuku, famous for its crazy fashion and youthful vibe, and the spacious and peaceful grounds of Meiji Shrine. The middle of the day is free time. 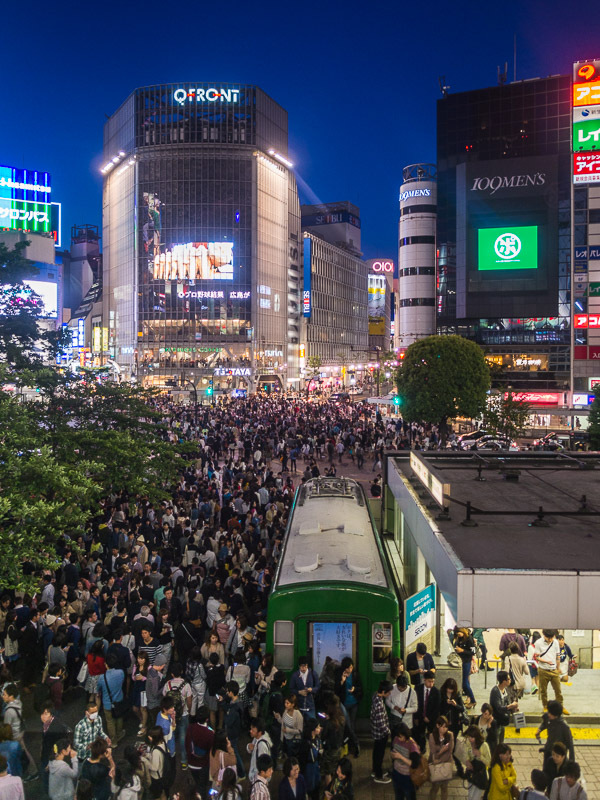 In the evening we visit Shibuya, home to the world’s busiest pedestrian crossing. 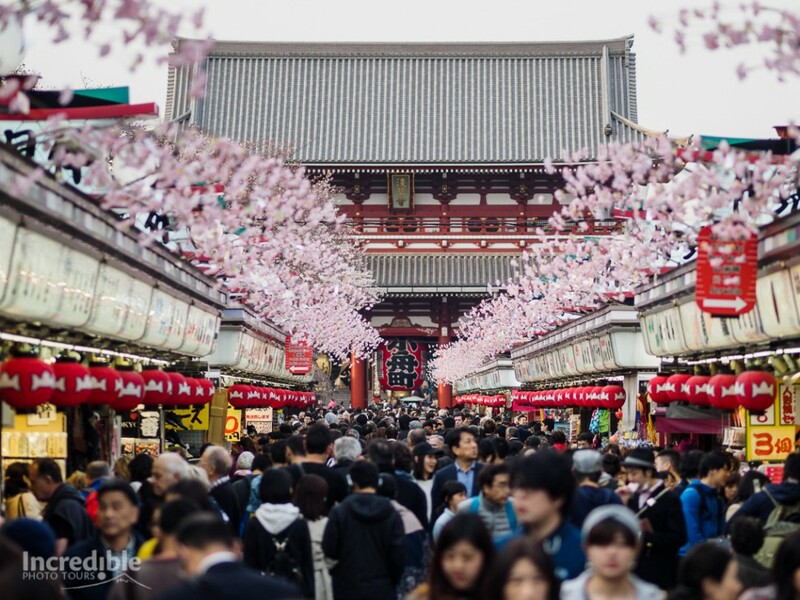 An action-packed day exploring several of Tokyo’s most famous sights. We start off with a morning visit to Sensoji Temple, one of Tokyo’s most important and popular temples. Next is Tsukiji Market, the largest wholesale fish and seafood market in the world. You can choose to have a delicious and amazing fresh sushi lunch after the visit. The end of our tour and after checkout we will assist you with transfers to the airport for your flight home or continue with your travels in Japan. Biei River near Shirohige Falls, Hokkaido.